These charming electric aroma diffusers use ultrasonic waves to instantly vaporize water and essential oil, producing a cool, fragrant mist. Only 1-3 drops of oil is needed per 100 ml of water used. Each unit comes equipped with a color changing LED light that has an impressive array of colors and settings. 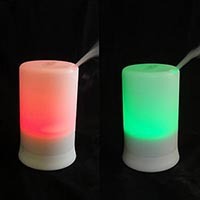 Find your favorite color or enjoy the full rainbow as the aroma diffuser gently transitions through the light spectrum. It’s also easy to keep it minimal and turn off the light feature. These attractive oil diffusers become little works of art wherever you put them, casting a pleasant glow while infusing any room with the therapeutic aroma of your favorite essential oils and blends.